September 12, 2012 - Airbus and the world’s largest A320 customer AirAsia announced that the airline will become the first operator of the A320 with ‘Sharklets’ when they take delivery of the first A320 equipped with these fuel-saving wing-tip devices at the end of this year. The aircraft exhibited on static and flying display at the ILA Berlin Air Show is the flight test aircraft for CFM engines and will also be delivered to AirAsia in 2013. In 2009 Airbus launched a new blended winglet design which the company called a "sharklet", designed to enhance the payload-range performance of the A320 Family. Offered as a retrofit option, sharklets are expected to result in a reduced fuel burn of at least 3.5 percent over longer sectors, corresponding to an annual CO2 reduction of around 700 tons per aircraft. The A320 will be the first model fitted with sharklets, which became available in 2012. “AirAsia is one of the fastest growing, most innovative and well-respected brands in the airline industry” said John Leahy, Airbus Chief Operating Officer, Customers. “It is a great endorsement that they have chosen our latest, fuel-saving aircraft of our successful A320 Family”. AirAsia is a Malaysian-based low-cost airline. 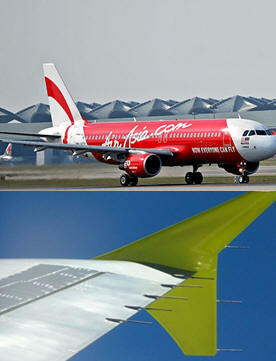 AirAsia is Asia's largest low-fare, no-frills airline and a pioneer of low-cost travel in Asia. AirAsia group operates scheduled domestic and international flights to over 400 destinations spanning 25 countries. Its main hub is the Low-Cost Carrier Terminal (LCCT) at Kuala Lumpur International Airport (KLIA). Its affiliate airlines Thai AirAsia, Indonesia AirAsia, AirAsia Philippines and AirAsia Japan have hubs in Suvarnabhumi Airport, Soekarno-Hatta International Airport, Clark International Airport and Narita International Airport respectively. AirAsia's registered office is in Petaling Jaya, Selangor while its head office is at Kuala Lumpur International Airport.